Los Angeles and Palm Springs, California. 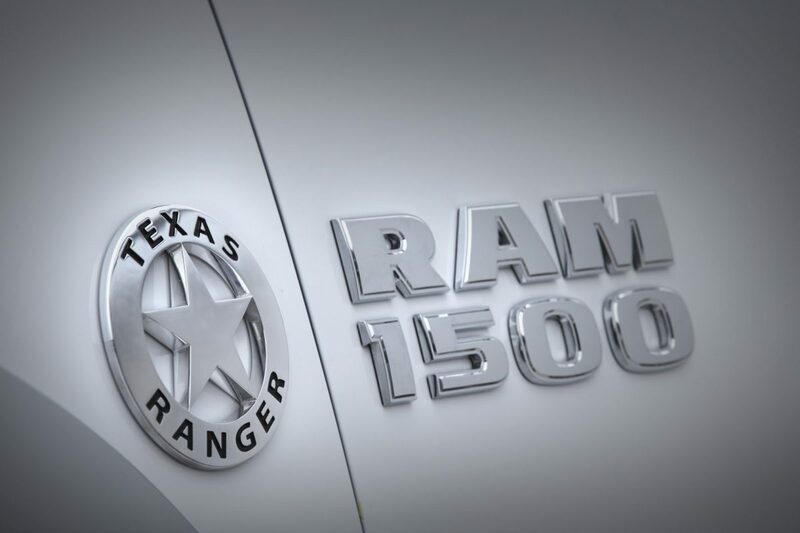 For 2015, Dodge introduces a new breed of Journey. One that has more visual appeal, lots of power and a few features to keep your drive exciting, even when it isn’t. Enter the Crossroad AWD edition. It’s clad in a Redline exterior pearl paint, and sparkles under the Californian sun or any sun for that matter. Thanks to distinctive front and rear fascias with Platinum Chrome accents, Platinum Chrome side sills, Platinum Chrome roof rails, dark-tinted headlamps and tail lamps, and unique 19-inch Hyper Black aluminum wheels, it tends to garner looks from all passersby. This particular Journey is a much better looking vehicle than I had anticipated and I’m impressed with how it has evolved since its introduction in 2009. 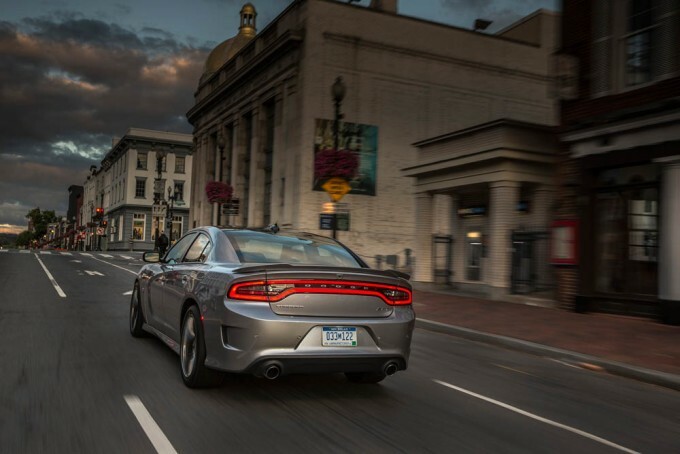 But it’s not just looks alone that make this crossover one of the best selling products in the Dodge lineup, and one that has earned numerous accolades. Inside, a visually stimulating cabin also welcomes the driver and passengers. First off, leather seats with sport mesh inserts come standard. Then you have Liquid Graphite appliques, a 213.4mm (8.4-inch) Uconnect touchscreen and a power driver’s seat and passenger fold flat seat with in-seat storage. The in-seat storage is a feature I found exceptionally handy, particularly when I wanted to tuck away some miscellaneous items I purchased along the road. Or I wanted to keep my snacks out of the sun when driving hours on end in California! Along the undulating SoCal roads, it was quite handy to have the 3.6L, Pentastar V6 engine under its hood for that extra bit of power I used climbing hills. It comes with a healthy helping of 283 horsepower and 260 lb-ft of torque and is matched with a six-speed automatic transmission that shifts with ease and smoothness. Additionally, the Crossroad version has a temperate nature and one that is pleasant to drive for long hauls. It absorbs road imperfections without jarring the passengers inside. The only snag comes when you want to accelerate quickly to pass someone. There’s a generous helping of torque steer so make sure you give yourself enough room in the lane to accommodate for it. Yes, it’s an all-wheel drive, so it’s not, by nature, prone to this type of action, but this particular vehicle was. Despite its size, it doesn’t feel like a chore to manouevre. Especially when navigating through the In-n-Out Burger drive-thru for a pre road trip delicacy. Though there were only three people in the cabin of the Journey at any given time, there is room for up to seven people. Furthermore, the third and second row fold down easily to load or unload larger ticket items, such as a road bike I had rented while in the Palm Springs area. When it comes to cargo space, behind the second row seats, you have a generous 1,000L, and behind the third row – when they are up – there’s 300L. Ingress and egress is also a strong feature of the Journey. Despite its SUV DNA, the seats aren’t so high off the ground that it requires passengers, both young and young at heart, to hoist themselves up and in. 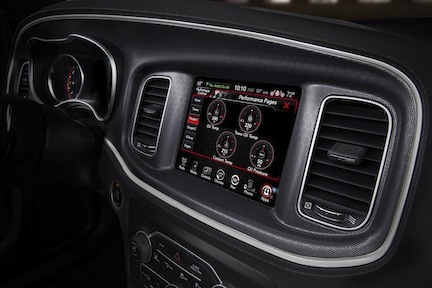 And I can’t forget to mention just how great it is to work with the Uconnect infotainment system. Entering in a destination into the navigation is probably the most intuitive and user-friendly in the industry. The 8.4-inch screen is large and therefore doesn’t require me to take my eyes off the road for longer than necessary. Music through the speakers – via the SiriusXM stations or my playlists – kept me grooving even in rush hour traffic. With the countless kilometres logged on this Dodge, it wasn’t too hard to find much joy in this new Journey. In fact, it was quite a treat. 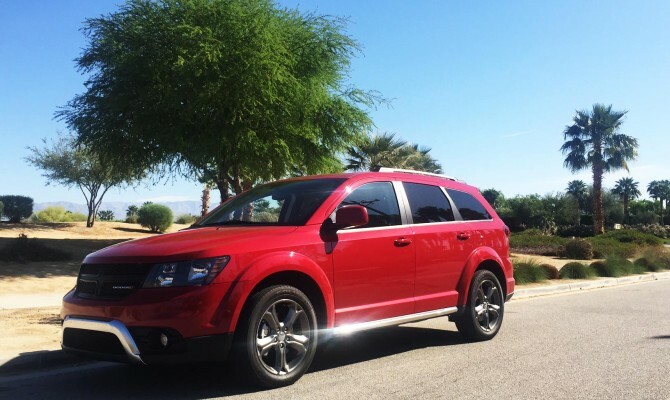 The base MSRP of the 2015 Dodge Journey Crossroad AWD is $35,395. 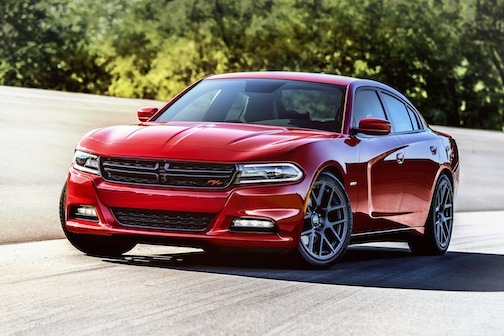 But beyond the muscle car guise, the Charger is still mostly used as a full-sized family sedan powered by the fourth engine, a more responsible award-winning 3.6-liter Pentastar V-6 making a very useable 292 horsepower and 260 pound-feet of torque. And it’s the only model that can be ordered with all-wheel drive. 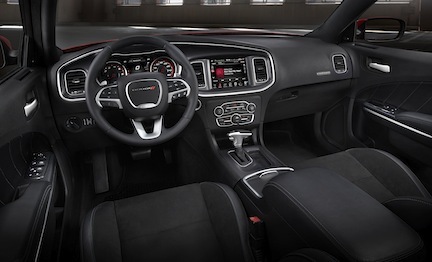 For 2015 the Charger offers a compelling choice in the segment because it comes with new, more chiseled styling; an upgraded interior; a full range of safety features; and a new eight-speed automatic transmission across the lineup. Prices across this vast array of choices start at a family-friendly $28,990 (including destination) for the SE to a whopping $67,085 for the Hellcat. In-between, the choices are many and the options are seemingly endless. It seems the new eight-speed automatic has made the powerful V-6 engine even more responsive. 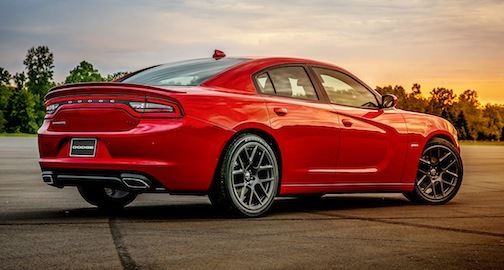 (When we last drove the Pentastar Charger engine in 2011 it was mated to a five-speed.) We never encountered even a minute when we wished for more power in real-life driving situations. The V-6 has been measured from 0-to-60 in around 6.5 seconds and 15.3 seconds at 95 mph in the quarter mile. This is accomplished with above average gas mileage for a big car weighing in at nearly two tons — 19 mpg city, 31 highway and 23 overall. Note that mileage falls off for all-wheel drive models, rated at 18/27/21. 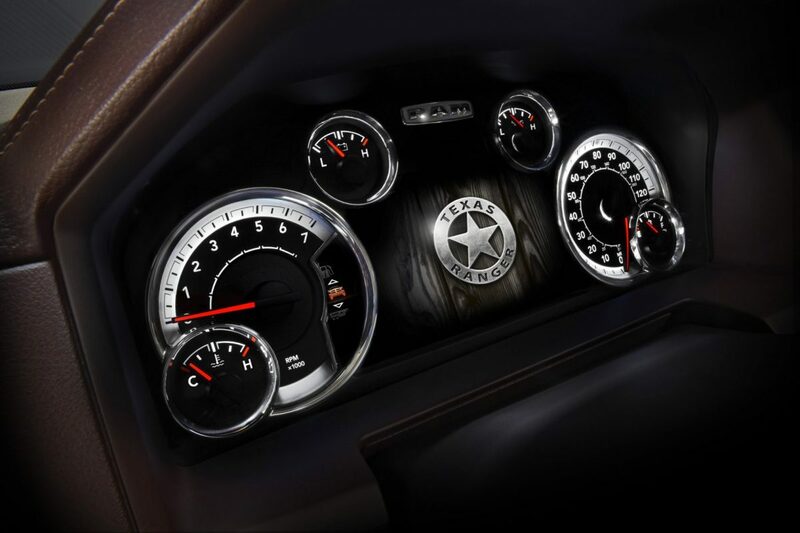 Since the Chrysler re-invention the company has upped its game with stylish, user-friendly interiors that are as good as any in the industry at the various price points. Quality materials are used throughout, but expect some hard plastics in the lower trims such as our SE test car, but we found nothing offensive. Our primary test car did not come with navigation so we got the base 5-inch information screen for radio and climate control readouts, and it worked well. If you move up to the SXT trim as we did, (a $2,000 bump) numerous options become available including navigation and a rear backup camera for an affordable $995. That brings the very useable 8.4-inch touchscreen interface with its large virtual buttons and its outstanding satellite radio readout. The front seats are large, comfortable and roomy. Rear-seat room is plentiful for two passengers, but a center rider will find the position uncomfortable. Leg room is decent as it should be in a full-sized sedan. Trunk room is good at 16.5 cubic feet. In the safety department, moving from SE to SXT also brings the blindspot monitoring option that we think should be available as standard equipment across the lineup. It comes in the Technology Group package for $1,995. The package also includes adaptive cruise control, power tilt and telescoping steering wheel, rain sensitive windshield wipers, advanced brake assist, lane departure warning, and several other features. If your budget screams at you to stick with the SE we found it to be a complete car for around 30 grand. Standard equipment includes 17-inch alloy wheels, dual-zone manual air conditioning, six-way power driver’s seat, six-speaker audio system with Bluetooth phone and audio connectivity, full power accessories, cruise control, and keyless entry and ignition. The manufacturer added a couple of worthwhile options to our SE test car including the Sport Equipment package that brings 18-inch satin carbon aluminum wheels, and a Popular Equipment package for an affordable $595 that includes satellite radio, remote start, and rear park assist bringing the bottom line to $30,580. The 2015 Jeep Renegade’s lineage may give some pause – the vehicle is built in Melfi, Italy. 2015 Jeep Renegade Limited 4WD: A smaller, (allegedly) lower-priced Jeep for a new kind of customer. Price: The test model started at $26,995 and rose to more than $31,000 with options ($995 for lane-departure and collision warnings, and park assist; $595 for security with cross-path detection; $295 for keyless start; more below). A front-wheel-drive version can be had for as low as $17,995. Reality: Instinct is really the lowest form of animal behavior.Very unJeeply? The new Renegade takes full advantage of the Fiat-Chrysler matrimony, giving the new Italian-built cousin (sharing some components with the Fiat 500X) a rugged-looking Jeepskin. But the Renegade still serves Jeep fans well with the off-road Trailhawk model. But the preproduction Renegade test model still had a few kinks to be worked out. Renegade seats: Upon sitting down, my first move was seat adjustment. I hit the slider to move the seat forward and back – nothing. After getting the seat to rise a bit, I couldn’t move it down. Back and forth remained sporadic. It made for an uncomfortable week. Renegade heat: I might have written off the seat malfunction if not for some trouble with heaters on my second trip. I fired up the Renegade on a warm night and noticed the seat and steering wheel heaters were on, buttons I had never touched. I turned off the seat heater, which obeyed. But when I tried the steering wheel heater, no dice. Preproduction: A Fiat-Chrysler spokesperson told me the steering wheel issue was being addressed, and the seat control issue was something new. Shifty: Power is sent to the Renegade’s wheels via a nine-speed automatic transmission. But the Renegade’s transmission stands out among Chrysler products because it is shiftable. The transmission is no match for the underpowered four and the heavy Renegade body. 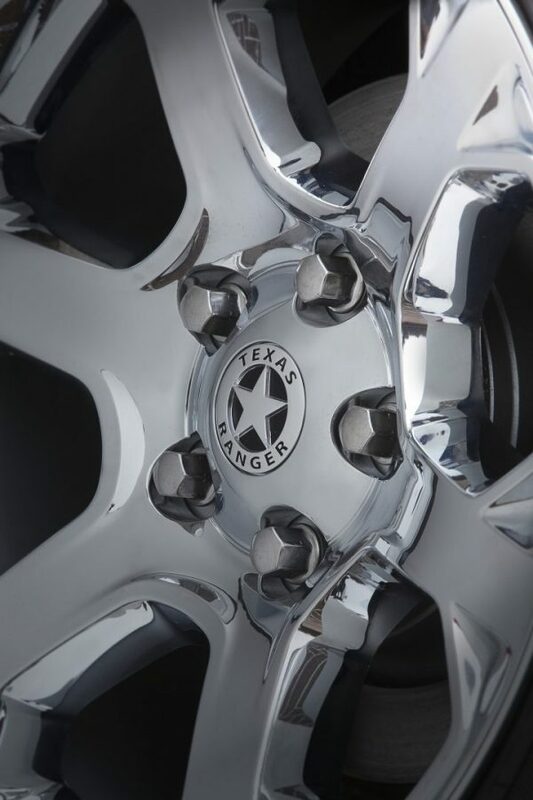 Sixth gear is about the highest that’s useful for country roads, and for most of the slightest grades on limited-access highways, as well. Up to speed: The Renegade is not a dog, though. For its size and shape, it accelerated just fine, but it liked to let the driver know how hard those 184 horses were working. Its power delivery was never smooth. On the road: Edmunds may have found the handling agile, but I’d call it “quirky.” On highway control, the Renegade definitely lived up to its name – one who deserts a party for another. I’d be zipping along into a curve, and could distinctly feel the steering shift ever so slightly. Inside: The interior is quite handsome and well-appointed. But Jeep lovers are a tough breed, so the Renegade’s leather seats are too stiff for Mr. Driver’s Seat’s tender seat. Play some tunes: The entertainment system (part of the $1,295 Navigation/Sirius XM package) has plenty of buttons outside the touchscreen to control functions. Source buttons across the bottom supplement the volume and tuning dials. Friends and stuff: Unlike Edmunds, I thought the rear seat provided plenty of room for 5-foot-10 riders like myself, although feet need to stay in place. Headroom is awesome. A middle seat passenger should not suffer too terribly from the hump or the console. Night shift: Interior lighting cast a subtle brightness, and the headlights shone where they needed to. Fuel economy: I averaged about 24 mpg in the usual Mr. Driver’s Seat mix of highway and suburban driving. Regular unleaded is fine for this engine, but the base model’s 1.4-liter selfishly wants premium. Where it’s built: Melfi, Italy. How it’s built: No reliability data are available from Consumer Reports on this model yet, but Fiats and Jeeps tend toward the black-circle, far-below average category. In the end: With the reliability ratings of Jeep and Fiat, I’d steer clear. But if the handsome styling or off-road capability appeals to you, I’d say see if the kinks get worked out. Maybe a 2016 will be better.